The trips tO WINDSOR, ONE OF BRITAIN'S MOST POPULAR DESTINATIONS, will depart THREE TIMES A DAY from London Waterloo on Tuesdays between June and September. Starting out from London Waterloo we pass many of London famous landmarks including the London Eye and Houses of Parliament. As we head towards the leafy suburbs, crossing the Thames at least once, we pass reservoirs and lakes to reach Windsor & Eton Riverside Station, designed by William Tite for the London & South Western Railway (LSWR) as a royal station. 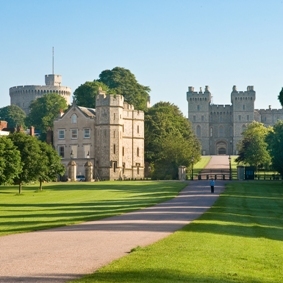 Crowned by Windsor Castle and linked by the River Thames, Windsor has a rich mix of history, culture, heritage and fun. Windsor is a town full of history and charm as you will discover when you visit. The town is dominated by Windsor Castle which is over 900 years old and the largest inhabited castle in the world! Aside from the Castle, theres much more to see and do, including visiting the award-winning Savill Garden, taking a guided tour of the town's numerous cobbled streets and Tudor buildings, or enjoying a walk along the pretty riverside.